Becoming a contributor on a popular shared board on Pinterest can really increase the number of repins and click throughs to your blog or website. This post will show you how to create shared boards and how to become a contributor as well as highlighting the many advantages. 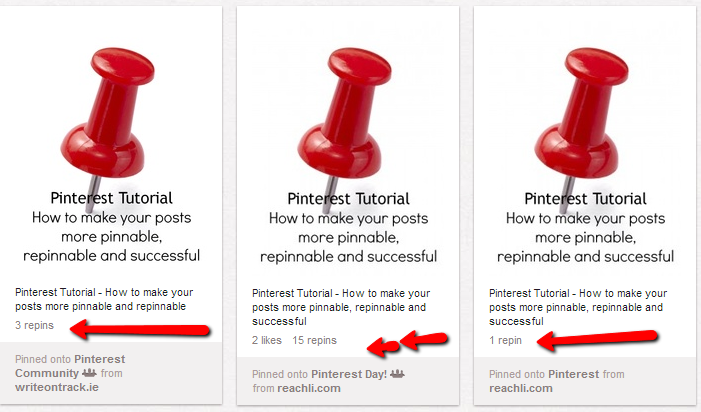 As you can see from the screenshot above, less than 24 hours after pinning the same blog post to 3 different boards, the pin pinned to my own ‘Pinterest’ individual board (with 508 followers) received just one repin, the pin pinned to the ‘Pinterest community’ shared board which has 206 contributors and 1,590 followers received 3 repins and the pin pinned to the ‘Pinterest Day’ shared board with 52 contributers and 6,350 followers received 15 repins. How Do You Find Suitable Contributor Boards? You can create your own shared boards and invite others to contribute. Become a thought leader in your field and invite others to contribute to a board in your specialist area. If you would like to contribute to my new contributor board entitled ‘Social Media 2013‘ do let me know. You may receive invites to become a contributor to various boards. Always check out the board before agreeing to ensure it is suitable for your brand and business as it will show up on your boards page. 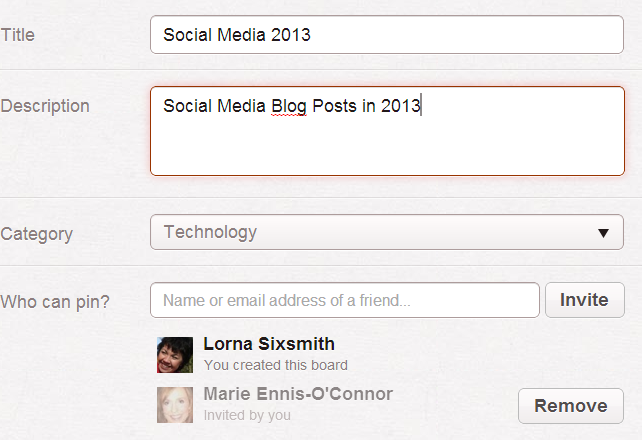 You can invite others to contribute to your own shared boards or a shared board that you already contribute to. All you have to do is follow at least one of their boards and type in their name or email address, then click ‘send invite’. Secret boards can become shared boards too and these offer a great way to plan with clients or colleagues. Remember, however, that any of the contributors to the secret board can put it public at any time. See our post ‘12 Ideas for Using Secret Boards on Pinterest‘. 3. Get to know more pinners. 4. Benefit from more repins and click throughs. 5. Can collaborate with others on projects/ideas. If you are interested in learning more about Pinterest, sign up to receive updates of our upcoming online courses which will be launched in April. Be in with a chance to win a free place on your course of choice too. Very interesting lorna. I can see how it would exponentially get your pins out there.